Dat beginnende borstkanker ook spontaan kan verdwijnen is algemeen bekend. Deze Noorse studie bewijst dat. Het volledige studierapport: The Natural History of Invasive Breast Cancers Detected by Screening Mammography is inmiddels gratis in te zien. Onderaan heb ik het abstract erbij geplaatst. Maar liefst 22% van beginnende borstkanker welke niet is ontdekt en dus ook niet behandeld door een tijdig gemaakte mammografie zou spontaan genezen zijn. Dit althans kwam naar buiten bij de publicatie van de resultaten van een grote langjarige gerandomiseerde studie bij ruim 100.000 Noorse vrouwen naar de effectiviteit van een regelmatig uitgevoerde mammografie. Lees hieronder een uitgebreid artikel geplaatst in Medscape dat probeert wat helderheid te geven over deze studie die toch wel heel opmerkelijk is. Want het kan ook maar zo zijn dat door de mammografie en de daaropvolgende biopt bij een vermoeden van kanker juist het biopt de schuld kan zijn van het ontstaan van verdere borstkanker. Echter 22% is wel erg veel verschil over een periode van 6 jaar en andere studies zouden hebben uitgewezen dat een biopt niet erg risicovol is. November 25, 2008 – A mammography study from Norway has come up with the controversial proposal that one fifth of breast cancer detected on screening may spontaneously regress. But there is no easy way to verify whether this is the case, say experts. I anticipate that many clinicians will react negatively to the possibility of spontaneous regression. In their review of possible explanations for the difference in the breast cancer rates between the 2 groups — which had similar risk factors for breast cancer — the researchers write that the "natural course for some screen-detected breast cancers may be to spontaneously regress." "I anticipate that many clinicians will react negatively to the possibility of spontaneous regression, said coauthor Jan Maehlen, MD, PhD, professor of pathology at the Ulleval University Hospital, in Oslo, Norway, in an interview with Medscape Oncology. We believe that there are 'pseudo' cancers in this population. "We believe that there are 'pseudo' cancers in this population [of mammography-screened women], and we suggest that most of these pseudo cancers regress," he added. What clinicians should do with such pseudo breast cancers is not known, admitted Dr. Maehlen. "We have presented [on the topic] before and had clinicians say angrily: 'Why are you presenting these data? We cannot tell which invasive cancers are a result of overdiagnosis and which ones will progress'." However, Dr. Maehlen believes the "first thing we have to accept" is that some detected cancer will not cause symptoms and some will regress. He cites pediatric neuroblastomas as an example of tumors that spontaneously regress. Uncertainty about the value of mammography continues. The authors of an accompanying editorial say that the study's spontaneous regression hypothesis is "difficult to rule out" but impossible to verify without a randomized controlled trial that would leave some participants untreated. The editorialists, Robert M. Kaplan, PhD, from the University of California, Los Angeles, and Franz Porzsolt, MD, PhD, from Clinical Economics, University of Ulm, in Germany, credit the study authors with using "a clever study design in an attempt to estimate the value of screening." "Despite the appeal of early detection of breast cancer, uncertainty about the value of mammography continues," observe the editorialists. In addition to Dr. Maehlen, Per-Henrik Zahl, MD, PhD, from the Norwegian Institute of Public Health, in Oslo, and Gilbert Welch, MD, MPH, from the Dartmouth Institute of Health Policy and Clinical Practice, in Hanover, New Hampshire, examined breast cancer rates among 119,472 women, aged 50 to 64 years, who were all invited to receive 3 biennial screening mammograms between 1996 and 2001 as part of the Norwegian Breast Cancer Screening Program. The researchers compared the rate of breast cancer among this "screened" group with rates among a control group of 109,784 women, aged 50 to 64 years in 1992, who would have been invited for screening if the program had existed at that time. Cancers were tracked for 6 years using a national registry. As anticipated, breast cancer rates were higher among screened women than among the control group. "If you screen for cancer, you will find more cancer [than is detected clinically]," commented Dr. Maehlen. However, at the end of 6 years, all participants — those in both the screened and control groups — were invited to undergo a 1-time screening to assess breast cancer prevalence. This is where the researchers found "something much less expected" — the fact that the rates continued to be higher in the screened group than in the control group. "Even after prevalence screening in controls, however, the cumulative incidence of invasive breast cancer remained 22% higher in the screened group," the authors write. Of every 100,000 screened women, 1909 had breast cancer during the 6-year period, compared with 1564 of every 100,000 in the control group. Screened women were more likely to have breast cancer at every age. Why the Difference in Rates? In search of the answer for the difference in cumulative breast cancer rates between the 2 groups — in which 1 group received 3 mammography screenings over 6 years and 1 group received only 1 screening at the end of 6 years — the researchers evaluated a range of possible explanations. "One possibility is that the case ascertainment in the Norwegian Cancer Registry became more complete over the period. However, during the period, the registry was documented to have almost perfect (98%–99%) solid tumor ascertainment rates, and its reported breast cancer incidence among women not of screening age (ie, age 30-49 years and 70 years) was remarkably constant," write the authors. The increased incidence in the screened group probably does not reflect any increasing sensitivity of mammography, add the study authors. "A number of factors leading to increased sensitivity over time could be hypothesized, such as the following: the interpretation skills of mammographers may be increasing with practice, prior mammograms may be increasingly available for comparison, and the technology itself may be improving. The available data, however, suggest that the sensitivity is stable," they note. The authors also consider and dismiss explanations about possible temporal differences between the 2 groups and possible differences in uses of hormone replacement therapy. This raises the possibility that the natural course of some screen-detected invasive breast cancers is to spontaneously regress. The authors settle on the explanation of spontaneous regression. "Because the cumulative incidence among controls never reached that of the screened group, it appears that some breast cancers detected by repeated mammographic screening would not persist to be detectable by a single mammogram at the end of 6 years. This raises the possibility that the natural course of some screen-detected invasive breast cancers is to spontaneously regress," the study authors write. They also note that other studies have suggested the same, including a Canadian trial in which the excess incidence of detected breast cancer was also 22% in a screened vs unscreened cohort study model (Ann Intern Med. 2002;137:305-312). Very few case reports support the concept of spontaneous regression. "[The lack of case reports] may reflect the fact that these cancers are rarely allowed to follow their natural course," explain the study authors. A randomized placebo controlled trial is unlikely to answer the questions raised by this new study, note the editorialists. "At present, most would consider a trial unethical," they write. The United States is not likely to be a source of new comparative studies on this subject because mammography is now common. However, other countries are just phasing in national programs and could be provide further nonexperimental comparisons, say the editorialists. This study was supported in part by a Research Enhancement Award from the Department of Veterans Affairs. Arch Intern Med. 2008;168:2311-2316, 2302-2303. The natural course of some screen-detected invasive breast cancers is to spontaneously regress. Background The introduction of screening mammography has been associated with sustained increases in breast cancer incidence. The natural history of these screen-detected cancers is not well understood. Methods We compared cumulative breast cancer incidence in age-matched cohorts of women residing in 4 Norwegian counties before and after the initiation of biennial mammography. 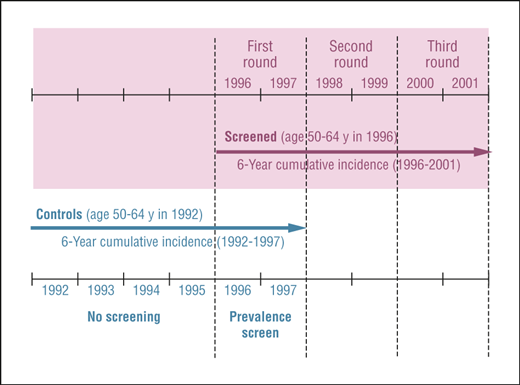 The screened group included all women who were invited for all 3 rounds of screening during the period 1996 through 2001 (age range in 1996, 50-64 years). The control group included all women who would have been invited for screening had there been a screening program during the period 1992 through 1997 (age range in 1992, 50-64 years). All women in the control group were invited to undergo a 1-time prevalence screen at the end of their observation period. Screening attendance was similar in both groups (screened, 78.3%, and controls, 79.5%). Counts of incident invasive breast cancers were obtained from the Norwegian Cancer Registry (in situ cancers were excluded). Results As expected, before the age-matched controls were invited to be screened at the end of their observation period, the cumulative incidence of invasive breast cancer was significantly higher in the screened group than in the controls (4-year cumulative incidence: 1268 vs 810 per 100 000 population; relative rate, 1.57; 95% confidence interval, 1.44-1.70). Even after prevalence screening in controls, however, the cumulative incidence of invasive breast cancer remained 22% higher in the screened group (6-year cumulative incidence: 1909 vs 1564 per 100 000 population; relative rate, 1.22; 95% confidence interval, 1.16-1.30). Higher incidence was observed in screened women at each year of age. Conclusions Because the cumulative incidence among controls never reached that of the screened group, it appears that some breast cancers detected by repeated mammographic screening would not persist to be detectable by a single mammogram at the end of 6 years. This raises the possibility that the natural course of some screen-detected invasive breast cancers is to spontaneously regress. Throughout Europe—including Denmark,1 Italy,2 Norway,3 Sweden,3 and the United Kingdom4—the initiation of screening mammography has been associated with increased breast cancer incidence among women of screening age. If all of thesenewly detected cancers were destined to progress and become clinically evident as women age, a fall in incidence among older women should soon follow. The fact that this decrease is not evident raises the question: What is the natural history of these additional screen-detected cancers? We consider herein the possibility of spontaneous regression in screen-detected invasive breast cancer. We make use of an exceptional natural experiment—the rapid and comprehensive introduction of biennial screening mammography in 4 Norwegian counties—to compare 6-year cumulative breast cancer incidence in a cohort of women aged 50 to 64 years at the start of the program with that of an age-matched cohort from 4 years earlier. The timing for this control cohort was chosen to overlap with the introduction of mammography and thus included a single 2-view mammogram (prevalence screen) at the end of the period. If spontaneous regression did not occur (ie, if all screen-detected breast cancers were to progress or even remain the same size), the cumulative incidence in the 2 cohorts would therefore be expected to be equal. Reageer op "Spontane genezingen: 22 procent van beginnende borstkanker zou spontaan genezen suggereert een groot langjarige bevolkingsonderzoek onder 100.000 Noorse vrouwen naar effecten en noodzakelijkheid van mammografie."